Yesterday I was lucky enough to go out for the day with my gorgeous daughter and handsome son. My youngest sadly had to go to school but he hates shopping anyway so wasn't too bothered. Phew! We jumped on the train and off we went to Dublin. When we got there I tried to persuade my kids to jump on the Luas (tram) but they decided to walk..so we had to walk all the way from Heuston station into town...we followed the tram lines which was quite funny.. The Luas guard had said it would be a twenty minute walk. And he has never walked it in high-heeled boots. Luckily enough I'd put my trainers in my bag...we changed them as soon as we reached the shopping centre. On the way through some def. dodgy areas we did find this. A wall decorated with Irish famous pepes! And as is family tradition, once we reached the shopping centre...everyone ran to the loo! So our first photos are from seats outside the very nice loos! Then for the Jervis Shopping centre! Well, second after the loo run.....slowly and gradually take my children to Santa's Grotto! Then, after threatening to steal other people's children and getting Santa's elf to help (she was very pretty and quite well endowed for an Elf which helped get my son in)...I actually persuaded my children to come in and see Father Christmas with me! Santa got my daughter to sit on his knee and asked her to hold his 'dingaling'....Santa def. had a bit of a glint in his eye and it was soooo funny. He was a great sport as were my children! DS and I were dragged along after dd who was shopping and saving the Irish economy single handedly. Eventually we decided to go and find somewhere to have some lunch. As soon as we went outside my dd managed to find a very strange character who wanted her to stand on his podium with her...personally I think he is a definite for a potential future Dr Who baddie! Then we came across some cool street dancers who were very good...great showmanship as well! East European breakdancing...they were great fun. Until one gave my daughter his number...I went off them a bit then! But I did relent and let my dd have her piccie taken with them. We decided to have lunch at the Hard Rock Cafe....it wasn't as good as I had hoped but I guess you have to do it once in a lifetime. The upside down mini appeared in a U2 video apparently. The food took a while to get to us, but at least it really was made fresh. DD bought me a large white wine to sup while we waited....and a second when it arrived! We had a ball. There's lots of rock and pop memorabilia including U2 hand written lyrics: Tina Turners shirt (not sure I believe that one though) and other things: guitars, pictures etc...and wine...there was lots of wine. Wine on an empty tummy is really not good...or rather for me it was very good: a bit too good! DD's cocktail had quite a good effect too! So after the meal we wobbled walked into Dublin city again. We found a lovely christmas tree which seemed happy to let us share a photo op. with it. Then we saw some tv cameras. We decided to get a bit closer so we could take pictures and then, before we knew it, we were being asked if we would like to do an advert! All we had to do was so a quote from our favourite movie. Poop: after two glasses of wine you want a quote?????? You have to be kidding?? "Bee Dah! Bee Dah! Bee Dah" haha. It was so funny...then they asked me to do ET Phone home...I held my finger up and did my impression and everyone cracked up. I had only used my middle finger! Honestly! I should have been given marks for forgetting it is a rude gesture! I honestly didn't think! Oh the Shame! Giving ET the middle finger...OMG I hope they don't use that one. I would be pretty amazed if they use any...I was very, very giggly! But they did let us take some piccies! This is the very nice producer lady! And they let us hold the clapper for a photo...they were great sports....omg though..the shame rofl! 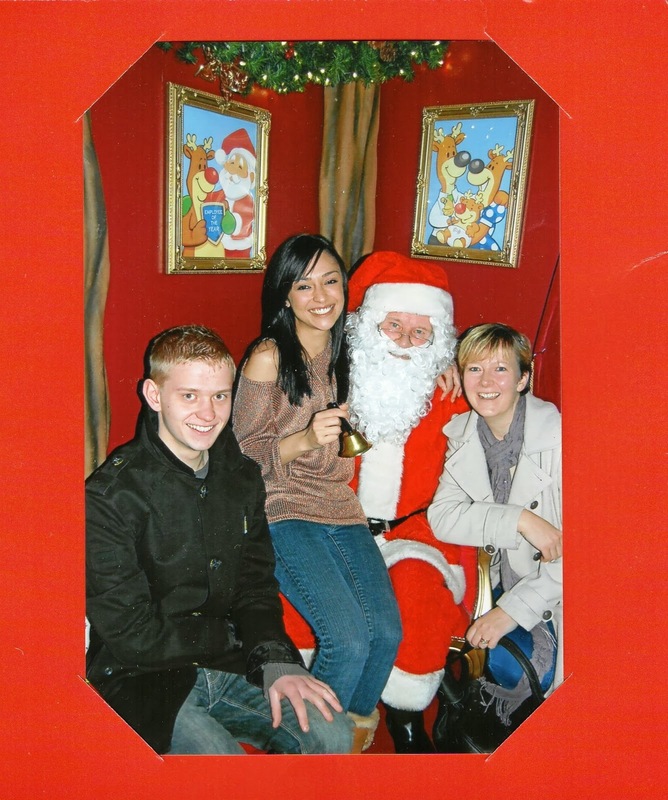 We found one more Santa to molest have a photo with and then it was back for the two and a half hour train ride back. It was a brillent day! We laughed so much and I def. made some excellent memories for my two eldest children...though I don't think I will ever be able to watch ET again! What a great day, and such wonderful memories were made! I enjoyed every moment you shared - glad you had fun and even shared the wine effects with us, :o). Yay for you and your gorgeous daughter and handsome son! What a great day you had! It looks like you had such fun! Loved all your photos, especially the great action shot of the break dancing! What a fun day! I enjoyed reading of your adventures. Making memories like these is what makes it all worthwhile. Thanks for sharing your story of such a fun day. I enjoyed all the photos. Glad you all had a wonderful time. Oh my gosh! You certainly have a fabulous day!! Thanks for the giggles and enjoy the memories! Thank you for sharing these gorgeous photos of your day out! I really enjoyed reading about your adventures. Been having a catch up read. What a great day out, lots of fun and Happy memories for you all. You drug hater is very attractive, no wonder the guys were eyeing her up. Saddened to read you are off to the hospital tomorrow, my thoughts and prayers will be with you. It looks like you had a wonderful time and how fun your children are! There are some great photos in there! What a brilliant day out with your children! Thanks for sharing all the fun. This is such a lovely post, it gave me a great big smile as I read it. Lol at you giving ET the finger😮! Great photos, you all had such a wonderful time.